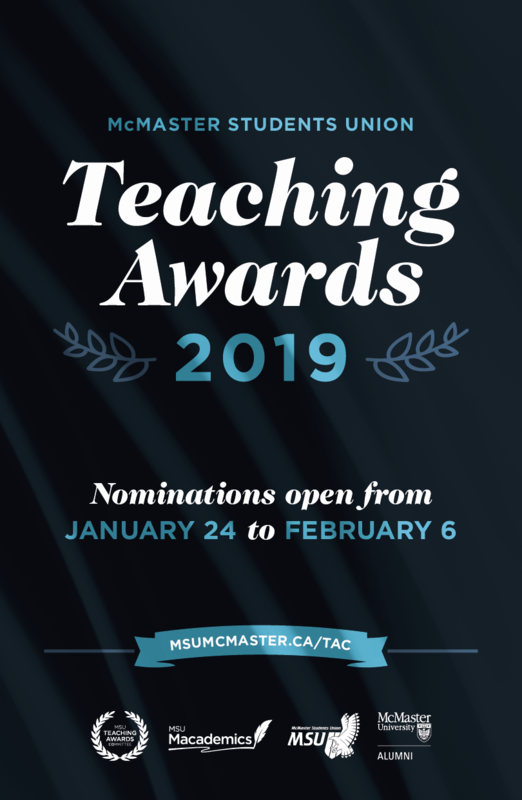 The Teaching Awards Committee runs nomination periods throughout the year, providing students with the opportunity to nominate the professors and teaching assistants (TAs) that demonstrated teaching excellence. At the end of an academic year, the Teaching Award Ceremony celebrates the distinction of those nominated and their contribution to the McMaster community. This term, the Teaching Awards nomination period will be open until Wednesday, February 6. Eligible nominees include all professors, instructors, and TAs from this semester. The nomination process takes around a minute and the form is available at msumcmaster.ca/TAC. Students can also submit a nomination in person at the Macademics table in MUSC and receive free chocolate, from February 4 - 6 during the hours of 9 AM - 4 PM at the tables in front of Union Market. The MSU Teaching Award Ceremony this year will take place on Friday, March 15 from 6 PM - 8 PM in CIBC Hall. All students are invited to attend and support their favourite nominated profs and TAs. There will be free food for all attendees. The ceremony will begin with introductory remarks by Provost and Vice President of McMaster, David Farrar, and will be a celebratory night in recognition of teaching excellence at McMaster. All guests are encouraged to dress in semi-formal or business casual attire.